Grown for the crisp juicy fruit, Nashi Pears are an Asian pear and and differ greatly from the familiar European types. All Nashis are cultivars of P. pyrifolia, P. ussuriensis or P x bretscheneideri. These are a low chill fruit tree, so it can be grown right through from Melbourne to Sydney and Brisbane. They are also self pollinating so you only need one tree to produce lots of fruit. These are a medium sized fruit tree, most varieties reaching around 3 metres in height. Nashi pear season is in autumn, this is when they are freshly picked, although they are available in shops through to spring. Fruiting time does vary from the early types such as Choju and Shinsui, which will be ready to pick in January. Late maturing varieties include Tsu Li, Shen Li and Okusankichi. Different varieties have different keeping qualities and ripening times so talk to the supplier before purchasing. Nijisseiki – A chance seedling of P. pyrifolia. Rounded green skinned fruit, heavy cropping with fruit smallish in size. Excellent eating. Kosui – A P. pyrifolia cultivator with golden yellow to brown fruit. Mis season harvest. Hosui – A P.pyrifolia hybrid. Rounded golden brown skinned fruit. Harvest is mid season. Okusankichi is one of the largest fruiting varieties, late to fruit, but long lasting, with a brown skin. Other varieties include – Shinsui, Chojuro, Tsu Li, Dan Bae, Hakko, Hosui, Shinsetsu, Hwa Hong, Niitaka, Shinsei, Bong Ri, Choju, Haeng Soo, Shin Soo, Shin Go, Kikusui, Yakumo, Shinseiki, Shinko and Shen Li. 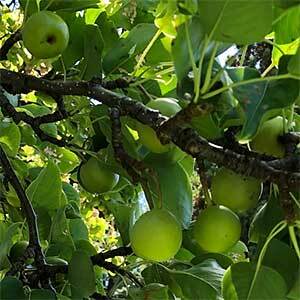 This is versatile fruit tree, the Nashi can be grown in similar conditions to pears. Most require a pollinator. Choose a sunny position with a humus rich well drained soil. Weed and dig over the soil to an area about twice the size of the pot, or root ball. Prepare the soil by digging in some well rotted compost, cow manure and some blood and bone. Remove the tree from the container and carefully prune off any damaged roots. Ensure that the graft is above the soil level. Water regularly though the first few summers. Nashi Pears are best pruned in late winter. The idea is to keep the tree a reasonable size, improve fruiting and maintain a sound tree structure. some summer pruning may be required. This involves the removal of any water shoots as well as thinning fruit if needed.